The SmartSource Quantum DS is a 12-pocket check and document transport that can take over the workload from your legacy high-speed sorting systems, including the former Burroughs Quantum series. Read on to find out more about how this device may be just what you need to keep your operations running smoothly for years to come. Most full-sized reader-sorter platforms, including the Burroughs Quantum (pictured at right) and NCR iTran series, have been out of production for years. Many are now also reaching the end of manufacturer support, leaving owners out of options for parts and service. What’s needed is an affordable, easy-to-maintain replacement that will be in service for years to come. The Quantum DS Can Help! If you’re struggling for a replacement, Digital Check has you covered. A large reader-sorter typically comes with a service contract of $10,000-$15,000 per year. That’s at least 4-6 times the usual cost of maintaining a Quantum DS, and finding parts can be a challenge. The Quantum DS is one of just a few high-volume reader-sorters still in active production. You can still order a new one, and we’re still making parts and actively improving the design. The Quantum DS uses the same application interface as the original Quantum series (although not all of the same features are available). Call us to double-check if you have questions about compatibility. At roughly 4 feet (1.2 m) in length, the Quantum DS isn’t exactly “small,” but it can fit on a tabletop. 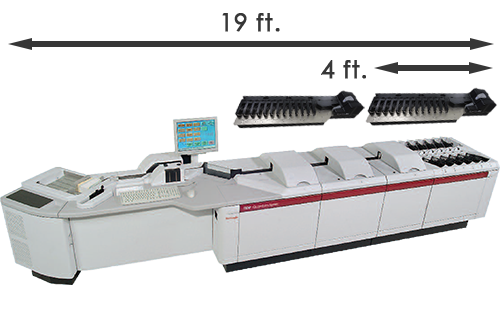 Full-sized reader-sorter machines can measure up to 19 feet long, and take up a whole room! At just a fraction of the price of its larger cousins, you could almost buy a new Quantum DS every year just with the money you save in maintenance costs over your legacy full-sized model! The feed mechanism is based on the SmartSource Professional series scanners, which are also still in production. Replacement parts are cheaper and readily available, and should be for a long time. One big difference between the Quantum DS and some legacy check transports is their speed. While the DS can handle a respectable 200 documents per minute, that’s still significantly slower than larger devices. However, since it is under a quarter the size, and a third or less of the cost, of a full-sized reader-sorter, it is quite practical to run two Quantum DS units in place of a single larger one. Many of our customers do exactly that – and also save 50% or more in maintenance costs along the way. With check usage today well below its peak volume, most customers are well served with two Quantum DS sorters. The second sorter also provides an in-house backup machine in the event of any hardware issue. Since the Quantum DS’ continuous-feed mechanism allows for additional stacks of documents to be inserted into the input tray while the device is in motion, it’s possible to run the device at top speed almost indefinitely! The Quantum DS has an input and feeder based on another one of our best-selling scanners, the SmartSource Professional. Since the SmartSource Professional also remains in current production (it received its most recent update in 2018) parts and service will be available for a long time – until well after both models are out of production. 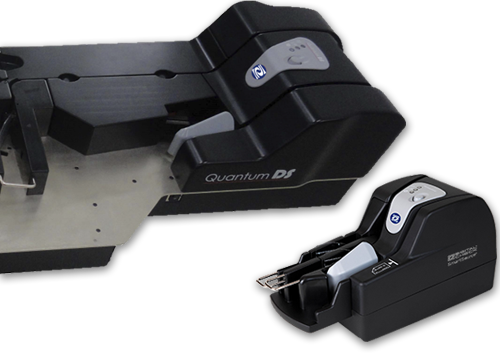 Consumables and replacement parts are MUCH less expensive for the Quantum DS than a full-sized reader-sorter. Since it shares mass-produced components with the SmartSource Professional, those parts are less costly and remain readily available. No special orders, and components are common and easy to come by. This is one more reason why the DS has a far lower ongoing cost of ownership!